Loquat or biwa in Japanese is a fruit grown out of the Chiba, Nagasaki, and Kagoshima prefecture in Japan. Generally speaking, it is grown between May and June. It is best stored out of sun light or in the refrigerator. Biwa is used to make jelly, jam, and fruit wine. 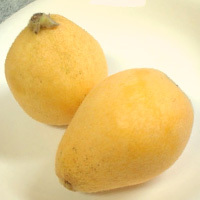 The calories in Loquat per 35g(1item edible part) is 14 calories. Loquat is calculated to be 40Cal per 100 grams making 80Cal equivalent to 200g with 3.71g of mostly carbohydrates、0.11g of protein、0.04g of fat in 35g while being rich in vitamins and minerals such as Vitamin A Retinol Equivalent and Manganese.